Cinema Soundtrack: Live Music at the TCFF! The live music before each film screening at the Traverse City Film Fest is a lot like the soundtrack to a film: It sets the scene, defines the mood, and absolutely elevates the audience experience. Many of the musicians who play TCFF are local, but a large number hail from around the state and the country. Traverse City’s Open Space, the biggest venue, is a coveted spot for performers, not only because of the huge crowds that attend: Every night brings two new bands, each playing a full show before the films starts, said Bihlman. So which of the many solo acts, duos, and bands should audiophiles keep an ear out for this year? Here’s our picks — and those of TCFF music intern Lorielle Walker — for the acts you can’t miss. 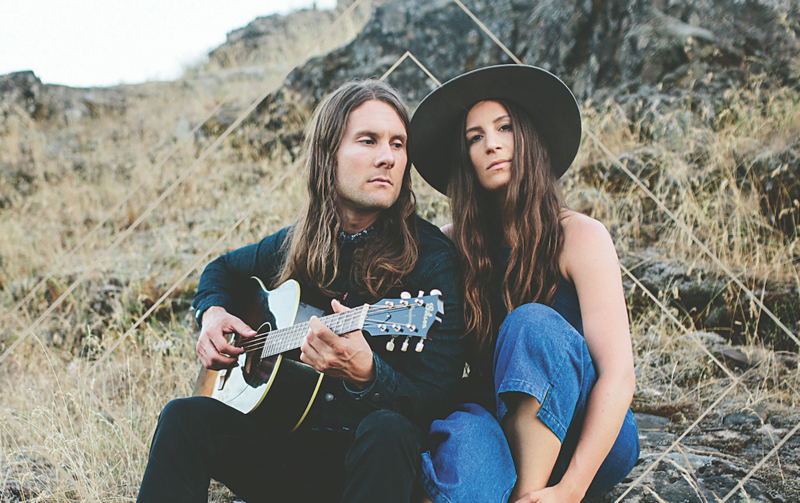 Their story: Married couple Nathaniel Hoff and Jillian Speece are an American indie folk-rock duo who’ve been going strong musically for almost 10 years. They started touring the U.S. after college, and eventually won the 2012 Bud Light Battle of the Bands, which led to opening spots for the likes of Young the Giant, All American Rejects, and Wiz Khalifa. You can also “play” one of their original songs, “Forget About Tomorrow,” on the video game Rock Band Rivals. Catch them: Tuesday, July 31, at the TCFF Opening Night Party, and Thursday, Aug. 2, at 7:30pm at the Open Space. Their story: The two met in the early aughts while both were trucking around Detroit’s underground music club scene. Once they combined forces, their sound really became something that commanded attention no matter where they performed. Joel Peterson (also of Immigrant Suns and Chatoyant) and Dave Shettler (also of Dead Band) have mastered the art of electronic keyboard improv, and they show off those skills on their debut album, Temporal Relics, inspired by the first time they sat down to record together and discovered that their musical skills clicked immediately. They’re currently promoting their newest release, Seven Thousand Year Plan. Catch them: Friday, Aug. 3, at the City Opera House, and Saturday, Aug. 4, at the Old Town Playhouse. Their story: The versatility of Rachel White and Matt Plessner allows them to diversify their sound. Depending on the venue, you can catch them as an acoustic duo, a folk-rock band, or as solo artists — both sing and play guitar — promoting their own albums (White’s debut EP Destination Sunday and Plessner’s fifth effort, Forest Blue are their latest.) The pair perform a stack of their own original material plus a selection of entertaining cover tunes at their live shows, and they’re planning to expand their sound even further by recording their very first album as Lightning Matches later this year. Their sound: With superb control over their vocal harmonies and their combined talent for songwriting, you’ll hear hints of Wilco, John Mellencamp, and country artists like Hunter Hayes in their sound. Once you add in their backing band members (Eric Locke on drums, Adam Parada on keyboards/bass), their tunes take on more of a rock turn. His story: Jolin has been crafting music — and the instruments he plays the music on — for almost five decades. He’s combined his formidable skill on hammered dulcimer, banjo, harmonica, and accordion with strong vocals to record eight albums, participate in over 80 artist-in-residence programs, and perform a ridiculously long list of live shows. (And yes, he builds instruments, too.) He and his wife hail from the foothills of the Appalachian Mountains, where the sounds of the local traditional music has become irreversibly intertwined with what Jolin performs. Alternating between reflective melodies and energetic folk stompers, his is compelling Americana music at its best. His sound: A mix of traditional folk, “old-timey” folk, and even Civil War tunes, Jolin’s performances are infused with humor and standout musicianship. “He actually plays every year here — he’s a longtime festival favorite,” Walker said. Catch him: Saturday, Aug. 4, at The Kubrick (Lars Hockstad Auditorium). His story: Now 16 albums in (the latest is Stray Volts), touring maverick Marinelli hones much of his sound on the road via treks through the U.S., the U.K., and western mainland Europe, where his post-punk/garage-rock mix pulls in fans of all of those genres, as well as those looking to listen to authentic Americana music. Marinelli also keeps things uber-real during his live shows, leaning solely on his own skills, swagger, and punk aesthetic to function as a modern-day one-man band, cranking through his shows on guitar and drums with only himself crafting the sounds. His sound: Recalling a mix of Guided by Voices and fellow punk-folkster Frank Turner, Marinelli digs into his songs with a gritty abandon straight from the lesser-mined underground of this particular musical genre. Catch him: Not available at time of press. His story: Singer-songwriter Brett Mitchell grew up in the Mitten State, but he didn’t start with guitar; that came later. He kicked off his music career as a drummer, and by the age of 17 was touring behind the kit for a wide range of bands. Once he became interested in songwriting, he added guitar to his repertoire, and by 2005 recorded his debut album, playing most of the instruments himself. Right now, though, he’s busy hyping his third album, Falling Apart at the Seams, a rock-country-folk hybrid that’s his most accomplished recording yet. His sound: Reminiscent of Marshall Crenshaw or Matthew Sweet, his tunes showcase his instrumental and vocal versatility. “He’s really great on the acoustic guitar, and his sets are such an upbeat mix,” Walker said. Catch him: Wednesday, Aug. 1 at Central High School and Old Town Playhouse (times not yet available); Thursday, Aug. 2 at the City Opera House; Saturday, Aug. 4 at the TCFF Filmmakers’ Party.